Result: Lost - by 8 wickets. Fresh-faced we made it to the ‘Woolpack’ in ‘Emmerdale’ to watch the Lions wrap up the tour down under (well everyone except Sandy who was cogitating on a particularly tricky anagram on 3 across). And so with a 100% Tour record set by Captain Morgan, it was First Officer Henderson’s job to go for another Saturday win. No , we don’t know who those two jokers are on the left either. 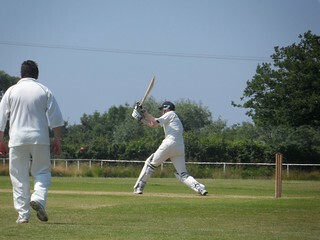 Following a tactical ‘negotiated’ toss on another roasting day, the power-packed batting line-up went into overdrive. In fact opener O’Reilly over-drove into mid-off’s hands and your lucky captain went on to make 34 against some tight and tricky bowling. Temporarily relieved of the stresses of captaincy, Ben carried on his glorious form of ‘013 with a typically clean striking 71, while his partners came and went including the annual appearance of Erdsy for 8 (his sumptuous cover-drive was worth the admission price alone) but the shadow of the ‘Duck’ loomed large over every incoming batsman. First to fall victim was Andy Hawkins who had an agonising wait in the man-made fibres until Gary Dunn’s long innings finally expired. 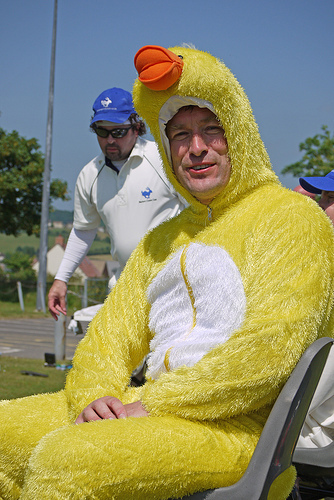 There was still more duck action as Andrew Sherratt completed the hat-trick of ducks. As he slowly cooked in the sunshine, all eyes were on the swinging bats of Messrs Morgan (14) and Jolly (6) and in the final over the tension mounted as Tour Sec Ireland hurried through for a crucial single as he edges towards his Barford career century – and of course avoided a session in the costume a la canard. 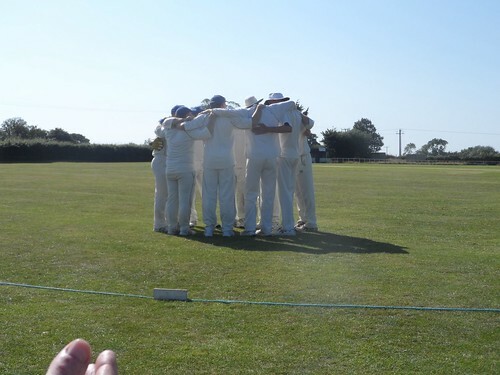 However it was felt that the total was not that would challenge a strong opposition on a fast outfield, but we bravely sent out Sherratt and Ireland with the new ball to do the damage. Mike duly struck (2/33), but coming down the hill was proving a nightmare for the paceman Hawkins, Dunn and Jolly who weren’t able to find a good length. In desperation O’Reilly’s leggies were brought in and your captain was about to turn to Erdsy’s (very) occasional bowling, but managed to have enough runs scored off his own over to bring the game to an early conclusion. Fortunately the Chairman was able to enjoy the afternoon off in the company of his close friend Stella under a well-paced tree at long leg, but overall the game was played in great spirit under cloudless skies and spectacular surroundings with tremendous hosts, who I hope we will be able to renew the acquaintance with next year.